We absolutely love the Monogram and Varsity trend! So what’s a better way to spend your weekend than by creating these cute Monogram DIY’s from this weeks tutorial round up? Pillows, Candles, Sweatshirts, Mugs and Wall Art not only make for great Home Decor but some amazing gifts as well! We collected the cutest 9 tutorials to get crafty! High Society Stationary: DIY Monogrammed Candles Beautifully “Stationary” like stencilled/painted candles! Knit Ampersand Wall Decoration Put your knitting powers to work on a wired Monogram or Ampersand! 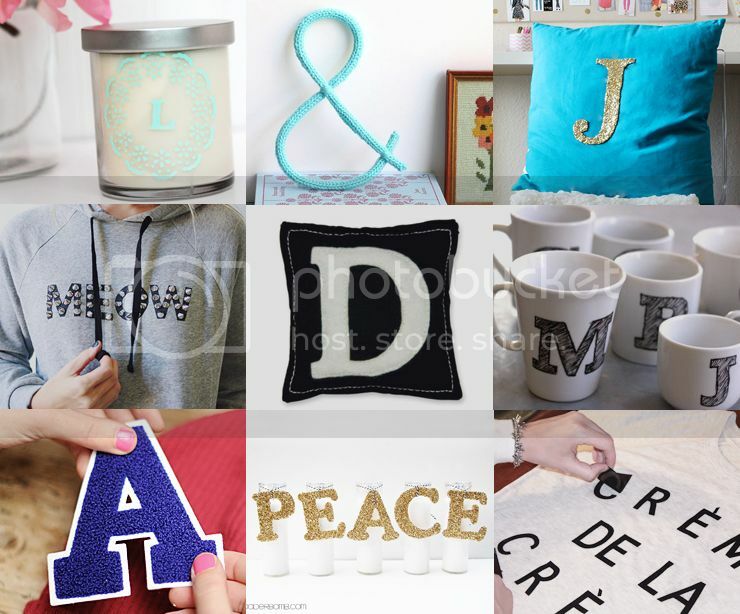 DIY Glitter Monogram Create some home decor pillow glitter and glam with this Tutorial! “MEOW” Studded Sweatshirt DIY Put monograms to work in creating a DIY Sweater! Monogrammed Pillow The felt on felt Monogram Pillow is such an easy and awesome home decor DIY! Monogram Mugs These Porcelain pen drawn Sketch Font Monograms are almost as delicious as a cup of hot cocoa! DIY Varsity Beanie Remember these? Alice and I put some Monograms to work on a DIY Beanie! Monogrammed Candles These DIY gold glitter Monogrammed candles are totally clever and cute! DIY Creme de la Creme sweater Creating a Creme de la Creme sweater with ‘Iron On’ flocked letters! Those are nice , I really like the candle and cushion one . Thanks for sharing your fav’ DIY! Especially the “crème de la crème” sweater. So nice. What a lovely diy idea. I have always had a ‘thing’ for letters in my house as display!… love it! i’m going to keep all those DIY! thank you!